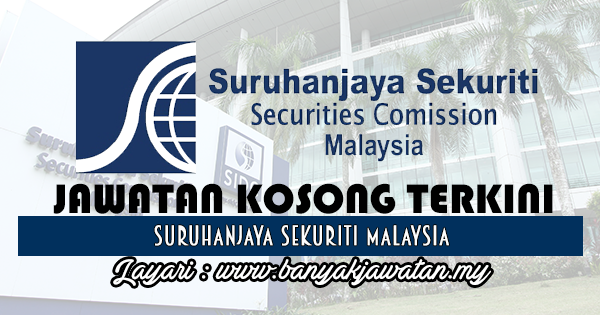 Established in 1993, the Securities Commission Malaysia (SC) is a self-funding statutory body set up by the Ministry of Finance with a dual mandate to facilitate the orderly development of the capital market, as well as to regulate to uphold investor protection and maintain the market integrity.Today Malaysia has a capital market size of RM2.7 trillion, the world’s largest sukuk market, third-largest bond market in Asia relative to GDP, and a growing unit trust industry with widespread levels of participation from confident and informed investors. The SC supervises market operators, market intermediaries and all matters relating to securities, derivatives contracts and unit trust schemes. We also register prospectuses of corporations and funds, approve corporate bond issues and regulate corporate mergers and acquisitions. Underpinning all these functions is the SC’s ultimate responsibility of protecting investors. * Sila baca arahan lengkap iklan kekosongan jawatan ini melalui link yang admin sediakan di atas. 0 Response to "Jawatan Kosong di Suruhanjaya Sekuriti Malaysia - 26 November 2017"